The Queen’s College. Photo courtesy of Godot13. Fifteen days, eleven hours and forty-five minutes. That’s how long until I arrive at the London Heathrow Airport to embark on an epic journey that still seems unreal to me. I will be studying abroad at Oxford University during my last semester of my undergraduate career at The University of Tampa. It has been extremely difficult to imagine that I will be studying at Oxford University. 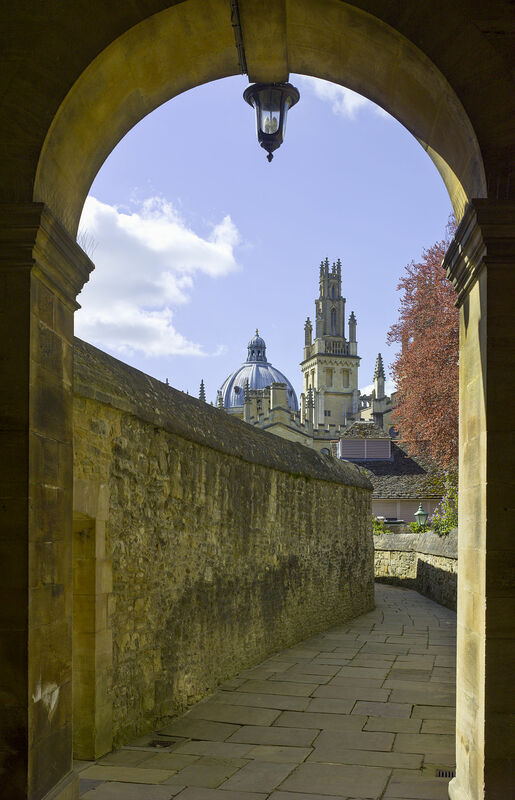 Oxford is home to one of the most respectable socio-legal studies programs in the world. I will be an associate member there. Just two years ago I was an anxious sophomore, terrified of public speaking to the point that I would tear up during presentations. Little did I know that my confidence and professional demeanor would undergo a unique metamorphosis when I joined The University of Tampa’s undergraduate Moot Court team, funded by the Honors Program. Thanks to the director at the time, Dr. Alisa Smith, and my fellow colleagues in appellate advocacy, I learned how to analyze case law and articulate my thoughts into articulate arguments. I also learned how to improvise and to have a conversation with a panel of judges. I finally became comfortable with communicating in front of an audience without anxiety consuming my thoughts. Chief Justice, your Honors, and may it please the court. My name is Nicole Lampe and I rise on behalf of Ms. Andrea Sommerville in the case at bar. I overcame one of the most difficult obstacles I had at the time. I am thankful to have had my fellow Honors students challenging me to become the best advocate that I can be. Later that semester, I took a leap of faith in myself and discovered more opportunities that The University of Tampa’s Honors Program possessed. I became involved in the Honors Council as campus ambassador and was chosen as a delegate of the 2014-2015 National Harvard Model United Nations sitting on the committee of human rights. I grew up in a small town in rural Indiana, where the main options for most young people were attending a community college or working in a factory. I dreamed about new adventures and I knew where I wanted to go. I wanted to be an activist, a researcher, and a sociologist. The University of Tampa Honors Program saw my vision and its faculty have supported me throughout my successes and failures as an undergraduate. I am deeply indebted to The University of Tampa’s Honors Program. Without their outstanding faculty and encouragement, I would not be the scholar I am today. I am especially grateful to Dr. Alisa Smith, Dr. J. Sumerau, Dr. Ryan Cragun, and Dr. Bruce Friesen for being wonderful mentors and for providing me the knowledge and resources I need to advocate for those who might not necessarily have a voice. I now have the extraordinary opportunity to study among the best and brightest scholars in the world at Oxford and I am confident I will thrive during the tutorial process. All of this is thanks to the Honors Program faculty and students. I’m excited to embrace this life changing experience.